WASHINGTON (CNN) -- The Congressional Budget Office is now estimating that limits on medical malpractice lawsuits -- reforms favored by many Republicans -- could save the government as much as $54 billion over the next 10 years. 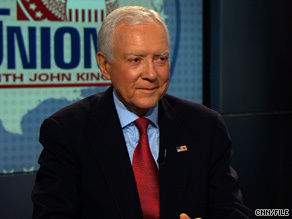 Sen. Orrin Hatch, R-Utah, has raised questions about how much malpractice reform would save. The government spends about $2.5 trillion on health care every year. A tort reform package that includes caps on jury awards of $500,000 for punitive damages and $250,000 for "pain and suffering" damages would lower liability insurance premiums by about 10 percent, according to a report from the nonpartisan office issued late last week. The research was revealed in a letter sent Friday from Douglas Elmendorf, director of the Congressional Budget Office, to Utah Sen. Orrin Hatch, a Republican who has raised questions about how much malpractice reform would save. But the reform package outlined in the report seems unlikely to pass, since the White House opposes capping jury awards. Two Democratic senators told CNN's "State of the Union with John King" on Sunday that regulating malpractice lawsuits is a flawed solution. "I don't think the way to go is to limit the rights of Americans who are injured by negligent or intentional conduct," Pennsylvania Sen. Bob Casey told CNN. "A $250,000 cap on damages, in my humble opinion, is insulting to our system of justice." Michigan Democratic Sen. Debbie Stabenow suggested that the Republican approach to malpractice reform was too simplistic. She said limits on damages imposed in Michigan had not stemmed increases in the malpractice insurance rates paid by doctors.